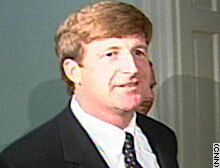 Sources said Rep. Patrick Kennedy's car swerved before crashing into a barricade. WASHINGTON (CNN) -- Rep. Patrick Kennedy, son of Sen. Ted Kennedy, said Thursday he was apparently disoriented by medication when he crashed his car into a barricade on Capitol Hill overnight. Rep. Kennedy said in a written statement late Thursday after media reports of the incident emerged that he had returned home after the final House votes around midnight Wednesday and taken "the prescribed amount" of sleep aid Ambien and an anti-nausea drug. The Rhode Island Democrat said that drug was Phenergan, "which in addition to treating gastroenteritis, I now know can cause drowsiness and sedation." "Sometime around 2:45 a.m., I drove the few blocks to the Capitol complex believing I needed to vote," he said. "Apparently, I was disoriented from the medication." He added, "At no time before the incident did I consume any alcohol" and said he would cooperate with any investigation. Kennedy, 39, was not injured in the accident, and he said his was the only car involved. Kennedy said police drove him home after the crash, but that he did not "ask for any special consideration." The elder Kennedy, a Massachusetts Democrat, said he had no comment. A top law enforcement official and an official in Congress said Capitol Hill Police witnessed the accident, and they reported that Kennedy was the only one in the car. A statement on the police Web site said, "The United States Capitol Police are investigating a traffic violation that occurred in the early morning hours ... in the 100 Block of C Street, SE." They did not identify who was involved or provide other details. The two officials said officers at the scene reported seeing the car swerve before the crash and said Kennedy appeared intoxicated. There was no indication from the sources that a sobriety test was given or that an arrest was made. CNN has made a formal request for an incident report from the Capitol Hill Police.